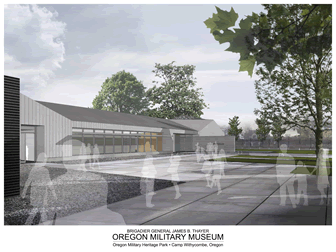 The Brigadier General James B Thayer Oregon Military Museum and Historic Park will honor the men and women who have served our state and nation in our armed forces. The world-class museum complex will provide a comprehensive educational resource for preserving and sharing our rich military history. Through our veteran’s stories, our children and future generations will learn the importance of citizenship, heroism and sacrifice. 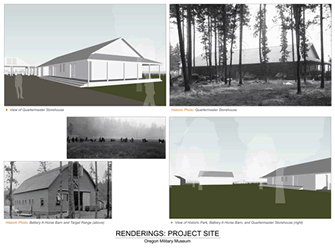 Oregon Military Museum Project (OMMP) is a 501(c)(3) Oregon non-profit corporation founded by Tommy Thayer, Amy Maxwell and James Thayer Jr. organized to raise funds necessary to complete the construction and exhibits and prepare future operations of the Oregon Military Museum. 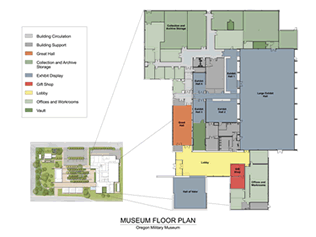 The Museum: The 32,000 sq ft Oregon Military Museum will include over 13,000 square feet of professionally designed, state-of-the-art, dynamic educational exhibits representing Oregon’s military history from the warrior traditions of Native Americans through today’s Global War on Terrorism. The museum’s multi-million dollar collection of 14,500 artifacts, 30,000 library volumes, and 750 cubic feet of archives includes one of the largest military firearms collections west of the Mississippi. Vast improvements to visitor services amenities, educational programming, and modernization of building systems will welcome, inspire and educate visitors, researchers, and school-age groups. The adjoining two-acre Historic Park and Honor Gardens will feature interpretive exhibits including two historic buildings that will take visitors back in time to the early 1900s. The design team is headed by world-renowned design architect Don Stastny and the highly decorated architectural design firm Hacker. 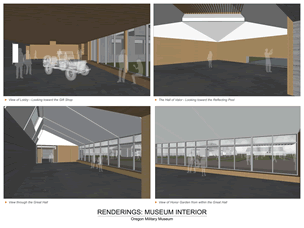 Fundraising: The project budget is $20 million for completion and exhibits. Through public and private funding $12 million has been secured to date. An additional $8 million is needed to complete the project. The Future: The OMMP’s goal is to accelerate fundraising for the completion of construction and exhibits over the next two years. 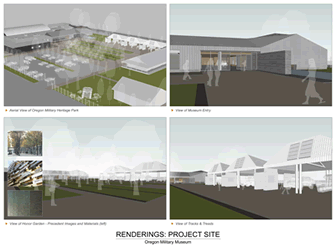 Once construction is complete and the museum opens, the OMMP will transition into the Oregon Military Museum Foundation. 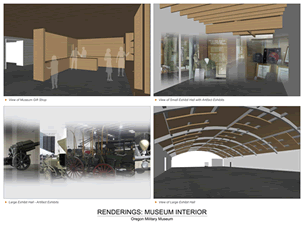 This permanent organization will work in coordination with the Military Museum Support Council and the Oregon Military Department to formulate a long-term plan for the museum endowment and financial sustainability for the ongoing operation and evolution of the museum.